When you’re the big fish, it’s not OK to pick on the little fish just because you can. That’s an important lesson for everyone. But some Houston first-graders got a particularly vivid demonstration in the form of a musical puppet show, which featured fish puppets and an underlying message about why it’s wrong to bully others. The puppeteer’s show was part of an effort to expand arts education in Houston elementary and middle schools. Now, a new study shows that the initiative helped students in a few ways: boosting students’ compassion for their classmates, lowering discipline rates, and improving students’ scores on writing tests. It’s just the latest study to find that giving students more access to the arts offers measurable benefits. And adding time for dance, theater, or visual arts isn’t at odds with traditional measures of academic success, according to the research — which amounts to one of the largest gold-standard studies on arts education ever conducted. 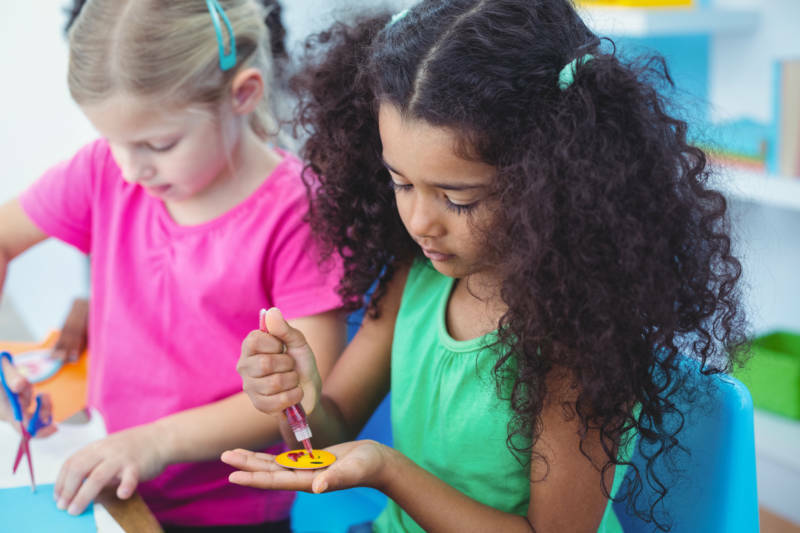 “Arts learning experiences benefit students in terms of social, emotional, and academic outcomes,” write researchers Dan Bowen of Texas A&M and Brian Kisida of the University of Missouri. The study, released Tuesday through the Houston Education Research Consortium, looked at elementary and middle schools — which predominantly served low-income students of color — that expressed interest in participating in Houston’s Arts Access Initiative. There appeared to be significant need: nearly a third of elementary and middle schools in the district reported lacking a full-time arts teacher. Too many schools were interested, which was bad news for some schools but good news for researchers. They worked with the district to randomly assign some schools to participate, with about 5,000 students in each group. The schools in the program offered students nearly eight “school-community arts partnerships,” compared to just three at comparison schools. What that looked like ran the gamut. Schools were encouraged to provide some exposure to theater, dance, music, and visual arts, and that took the form of on-campus performances, field trips, artists in residence, and other programs outside of school hours. On other measures, the initiative didn’t make a clear difference. That includes reading and math scores as well as survey questions about school engagement and college aspirations. Still, the survey results were mostly positive, though largely not statistically significant. That’s especially notable because some have feared that pressure to raise test scores has squeezed arts out of the curriculum in many schools (though there’s limited empirical evidence on whether that’s actually happened). Other recent studies on field trips to the theater and museums have also found encouraging results, boosting students’ political tolerance, interest in the arts, critical examination of art, and, in one case, math and reading test scores. And since low-income children are less likely than their wealthier peers to access things like plays and art galleries over the summer, schools are critical providers of those cultural experiences and the accompanying benefits. The latest study came to a mix of conclusions about which group of students benefited the most from the extra arts education. Tiffany Thompson, another first-grade teacher at Codwell Elementary, said she’s seen the extra arts make a difference for struggling students. “Some students who don’t excel academically, they’re more engaged, because it gives them a different way to learn,” she said. One caveat to the study is that principals volunteered for the program. It might not be as successful in schools where there is less enthusiasm for the idea to start. Still, the results of the study hold national import as districts consider how much to prioritize arts education and as cities assess or expand their similar initiatives. Correction: A previous version of the story mis-stated the number of partnerships in schools that participated in the arts initiative. The correct number is eight, compared to three in schools that did not participate.